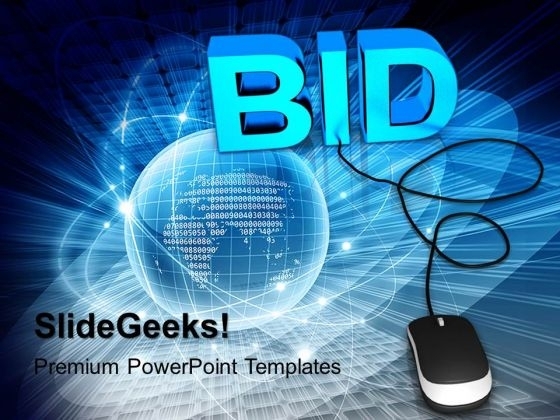 Bid With Computer Mouse PowerPoint Templates And PowerPoint Themes 1012-Develop competitive advantage with our above template which contains a diagram of 3d word BID connected to computer mouse. It imitates the e-mail, internet, online, purchase, retail, sale, shopping etc. Use this template for presentations related to commerce, finance, shopping and technology. Our PPT images are so perfectly designed that it reveals the very basis of our PPT template are an effective tool to make your clients understand.-Bid With Computer Mouse PowerPoint Templates And PowerPoint Themes 1012-This PowerPoint template can be used for presentations relating to-"Bid with computer mouse, computer, internet, marketing, business, sales" Index your ascent with our Bid With Computer Mouse PowerPoint Templates And PowerPoint Themes 1012. Illustrate every step of the way. Whatever the fare, add on our Bid With Computer Mouse PowerPoint Templates And PowerPoint Themes 1012. They go down well with everything.